New option for "Convert To Relative Form": "Set Notes To Nearest Scale/Chord Note"
New setting: "Send VST Editor Keystrokes To RapidComposer"
New setting: "Make VST Editors Always On Top"
[OS X] VST editor window size was not correct for NI Massive. Dynamic sizing of the VST editor window by the plug-in works well. Text editing issue fixed which appeared in v3.01. Second Enter press was ignored. All issues with the timeline resize handle were fixed. Better visibility when scrolling to the rightmost position. Sometimes chords with an octave '5' appeared in generated progressions. This is fixed. New variation: "Apply Rhythm". You can slice notes of an existing phrase using a rhythm pattern. New rhythm generator: "Euclidean Rhythm"
It is possible to use 'Render Phrase With Variations' on absolute phrases. Note lengths are not expressed in beats anymore. Quarter note (1/4) is used as a 'beat'. Brand new redesigned phrase/instrument/scale/chord/chord progression browsers with advanced searching, filtering, tagging, grouping, sorting, displaying capabilities, using conditional expressions when needed. Use the 'right click' to preview or add tags. It is possible to arrange custom phrases in hierarchical directories. Assign tags to multiple instruments, phrases. It is also possible to display and filter by tags. 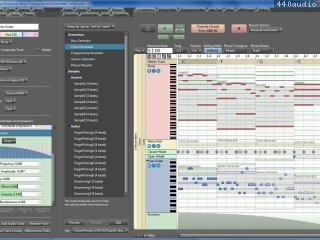 [VST] An internal sequencer is added. It is possible to choose between local transport or host transport. [VST] The internal logic was reworked. As a result the plug-in will work better (especially looping) in some hosts. New preference: "Allow transposition in guitar tracks"
New preference: "Open VST plug-in editor window after it was loaded"
The scale, tempo and signature properties are displayed on the master track and editable with a single click\tRight/secondary click on the master track allows you to add or remove scale/tempo/signature. [Windows] Drag-and-drop stopped working in the program. Fixed. An optional name field is added to 'Save Selected Phrases' which is auto-incremented if it contains a number. General MIDI Controller set was not added to imported MIDI tracks when set in the preferences. Custom phrases are saved in separate files. A phrase is written to file immediately when added to the browser. Add composition to history with comments (shortcut: K). It is easy to look up an earlier state. Various fixes and improvements in the structure editor. Rearrange parts and lines by drag and drop. 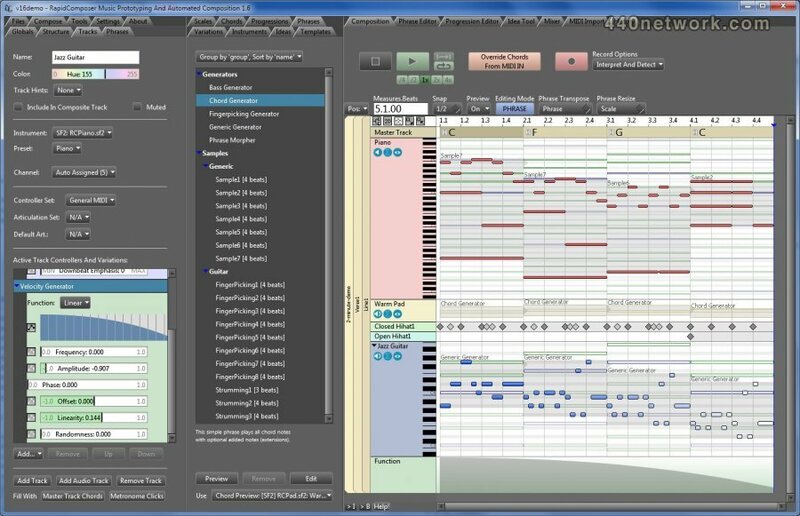 Exported MIDI sometimes included the metronome track. This is fixed. The rhythm was not saved in the phrase browser for custom phrases that used "Manual Editing"
Possible crash at MIDI import fixed (for corrupted MIDI files, or files containing unexpected data). MIDI import stability improved. Fixed the crash when the MIDI keyboard sent a message to the chord palette which was opened in the phrase editor. 4 algorithms offered for absolute-to-relative note conversion. Now you can work with scale-relative notes only, without depending on chord notes in the phrase. Ableton Live! called the VST plug-in 'close' function without calling 'open' first. This is handled gracefully now. Fixed crash when clicking on "Scan Soundfonts"
[Windows XP] Fix for a freezing issue with new locks introduced in v2.6 (affects only Windows XP users). This major update includes the long-awaited VST version with 128-channel MIDI output. The rewrite of the manual has begun, from today it is available only in pdf format. The standalone version has some minor features and fixes for several bugs.